Constant Contact: gain new leads from chats! Constant Contact allows you to gain new subscribers when your chat is finished. Use this opportunity to grow your newsletter list! 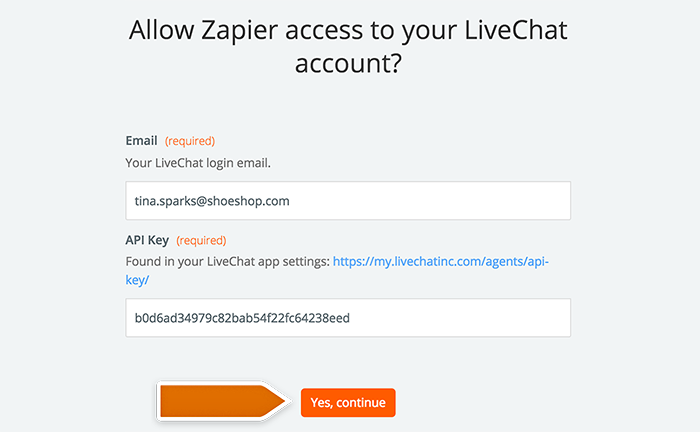 We prepared a short tutorial on how to integrate LiveChat with Constant Contact with the use of Zapier. We hope that you will enjoy it! On the Choose an Action App section, type Constant Contact into the search field and choose the app from the list. Next, choose Create Contact as the Zap’s action and click on Save + Continue to proceed. Now it is time to add your Constant Contact account to Zapier. To do that, click on Connect a New Account button. A new window will pop-up. There, provide your credentials and click on Log in button. On the next screen, click on Allow button to continue. On the next section, set up your Constant Contact and click on Continue button. On the next section, you will see a summary of a contact that will be created in your Constant Contact account. It is also time to test if LiveChat is successfully integrated with Constant Contact. Done! Now your LiveChat is integrated with Constant Contact. All that is left to do is to turn on your new Zap. To launch your Zap, click on the grey switch. That will start passing the information from LiveChat to Constant Contact. Also, don’t forget to name your Zap so that you will be able to find it on your Zapier Dashboard more easily! Done! Now, your Constant Contact integration is ready and each time your chat will finish, the new file will be created in your Constant Contact account.